**This is a post written by me on behalf of Grace Hill Media and The Miracle Season. All thoughts are 100% my own. What is it about a sports movie that always seems to draw us in? I suppose for some it's the actual love of sports, but for me? Not so much. I couldn't tell you a touchdown from a home run, nor could I tell you what sport was in season or name one current sports star. Sports just aren't really my thing. But I do love a good sports movie. There's just something about those stories of overcoming--- working through whatever obstacles are standing in the way and winning that big game/race/medal, whatever! The thing is, while we mostly see these themes in those good ol' sports films, these are lessons that we can apply to our lives anywhere. I was recently asked to think about a time where I fought through obstacles and succeeded at a skill or activity at hand. As I thought about this I realized, there were many instances in my life where I had proven to myself that I could overcome. It might not have been in the grand stories from these movies, but in the little moments. Fighting through migraine inducing anxiety to get through school, even when it meant working harder to finish early. Fighting through stage fright (and again severe anxiety) to perform in choir and at my church. Even fighting through anxiety to do the best for my son when he needed it most. Those tasks weren't easy. It took time, it took work, and more than anything it took a passion and desire to overcome. When I thought about those moments, I realized that I too truly was an overcomer, and that was a reminder I needed in this moment. This moment where I am dealing with chronic pain every day. This moment when my mental health and physical health are fighting against each other and wearing me down. This moment when my autistic son is struggling more than he ever has and I so often feel at a loss as to what to do next. But I think about these moments and I realize, I've got this. It's not going to be easy, but we truly can do absolutely anything with enough hard work and time, and the passion and desire to do so. We simply cannot give up. And you know, that truly is the appeal of these inspirational sports stories... whether we play sports, whether it's another activity we strive to be great at, or whether it's just getting through the every day struggles that life sends our way, we all need those reminders that anything is possible and that we are ALL fighters. 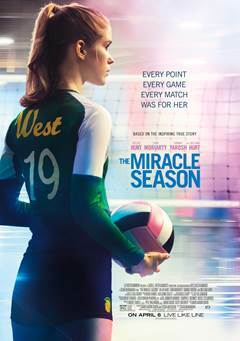 Synopsis: Based on the inspiring true story of West High School girls' volleyball team. After the tragic death of the school's star player Caroline "Line" Found, the remaining team players must band together under the guidance of their tough-love coach in hope of winning the state championship. This sounds like a fantastic movie, and one that I certainly cannot wait to see soon... with tissues handy as it's sure to be a tearjerker (the best ones always are). Thankfully, the wait is almost over! We can see The Miracle Season in Theaters: April 6th. Do you love a good sports movie? How do they inspire you? What are some real life instances in which you overcame obstacles and came out on the other side? How have you fought and won for the activities or the moments that meant the most to you?